Powers over certain elements of Universal Credit will be devolved to Scotland. 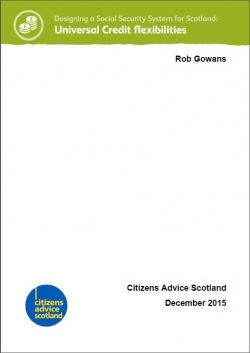 This report sets the findings of a survey of CAB clients on how they currently budget and would prefer to receive payments, and makes recommendations for how the new devolved powers could be used. To find out what would work best for people who need support from Universal Credit (UC), we surveyed 601 CAB clients across the country, most of whom currently receive one of the benefits being replaced by UC. We asked them how they currently budgeted, how they coped on the income they received and how they would prefer to receive payments if they had the choice. The housing element of Universal Credit is paid in the same way as Housing Benefit currently is, with claimants able to have housing payments made directly to social landlords.